he North Laine Community Association (NLCA) focusses its attention on the North Laine conservation area, which is roughly bounded by Frederick Street and Frederick Place, Trafalgar Street, the west side of Victoria Gardens and Church Street (and also includes Bond Street, Jew Street, King Street and Portland Street) in the St Peters and North Laine ward. The NLCA holds monthly meetings at 8pm on the 2nd Monday of each month at Brighthelm Church and Community Centre. Meetings focus on a range of local issues including planning and licencing. meetings are open to all residents of the area and are attended by ward councillors and the police. The London Road LAT is in the St Peters and North Laine ward, and covers the northern end of the ward. 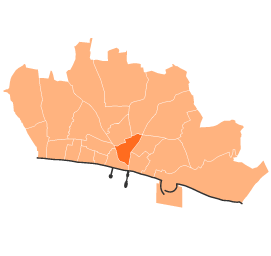 The boundaries are; Ditchling Rise to the north, Ditchling Road and the Level to the east , St Peters Church to the south and the New England Quarter to the west. Meetings are currently held at the Calvary Church on Viaduct Road (next to the firestation at Preston Circus) on the first Tuesday of each month (not August) at 6.30pm. Meetings are attended by ward councillors, the neighbourhood policing team, council officers, residents and community association representatives and local residents and traders. meetings are open to anyone living and/or working in the area of interest. The West Hill LAT includes the area bounded by the Clock Tower, Queens Road/Terminus Road/Howard Place, Seven Dials and Dyke Road in the St Peters and North Laine ward.